The hot tub and sauna were good. The on-site restaurant had good food. 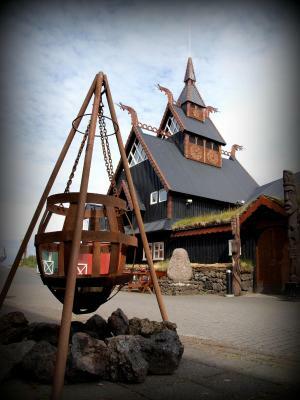 Viking themed hotel is the main attraction. They have a hot tub and sauna available. 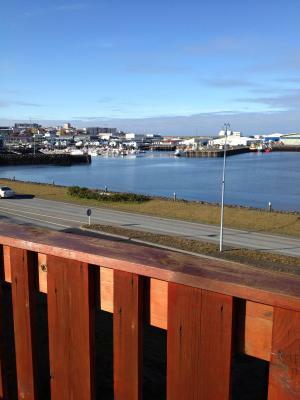 Close to or short driving distance to all the points of interest in the Reykjavík area. The room was incredibly small and cramped. Check-in was easy and the restaurant had quick service. The theme of the hotel is really nice specially the cabins and the location is very accessible. Good and free parking spaces. My husband love the very deep bathtub and took several hours in the water that had some sulfur in it. The room was large then the small standard and we did have a room to spread out.Steph was very efficient but not particularly friendly. It seem like it at times during breakfast we were in the way as they scurried around to refill breakfast food. Location was good in this little fishing village you could walk to grocery store or restaurant etc. The location was very convenient for the Blue Lagoon and the airport. The breakfast buffet was excellent. The staff were lovely. The building was fantastic. The hot tub was fantastic but lacked a place to put personal items. All in all I loved this place, it was warm, comfortable and safe for a solo female traveller. I will be coming back. Very funky hotel at a very good location :) The breakfast was very good as well! Viking decoration was awesome and made the stay worth it! Hotel Viking This rating is a reflection of how the property compares to the industry standard when it comes to price, facilities and services available. It's based on a self-evaluation by the property. Use this rating to help choose your stay! 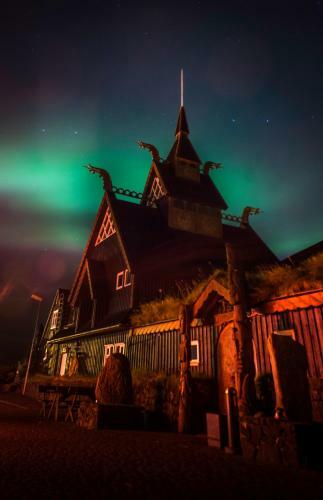 This Viking-themed hotel is housed in the same building as the West Nordic Culture House, in the seaside town of Hafnarfjordur. Parking, WiFi and access to a sauna and hot tub are all free. Décor and furnishings in Hotel Viking’s guest rooms are inspired from Iceland’s history and culture. Satellite TV and a coffee/tea maker are found in each room. Some also offer sea and harbor views. 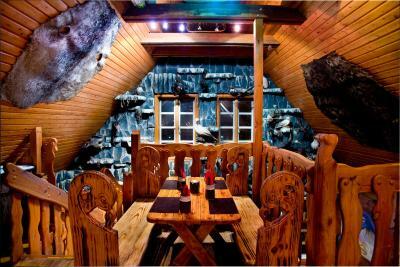 Traditional, regional cuisine is served in the cozy Valhalla Restaurant. 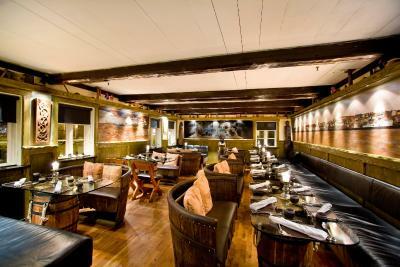 An old-fashioned Viking feast can be enjoyed in Viking Restaurant. Hotel Viking also offers a cold, Icelandic breakfast. The Keflavik International Airport shuttle bus stops directly in front of Viking Hotel. Reykjavik’s city center, 6.2 mi away, can be reached in less than 15 minutes by bus. 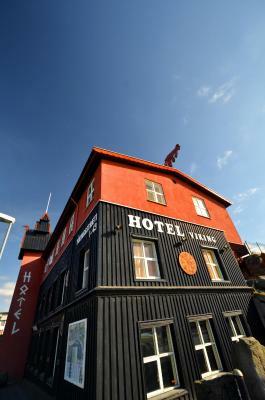 When would you like to stay at Hotel Viking? Includes a seating area, tea/coffee facilities and a TV with satellite channels. Includes tea/coffee facilities and a TV with satellite channels. Features tea/coffee facilities and a TV with satellite channels. Spacious room that features tea/coffee facilities, as well as satellite TV. Features Viking-inspired furnishings, satellite TV, an electric kettle, along with a private bathroom. Dear Guest, Be Welcome!! 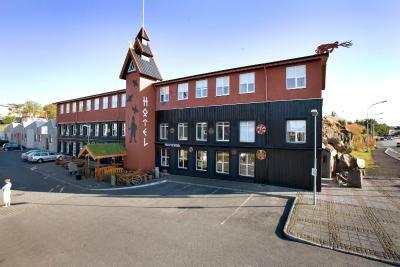 Staying with us, you will find all the information you need about our hotel and the services that are available in and around the capital area of Iceland. Our team is happy to help schedule any tours or give extra information about the not-to-miss events in the area –Don‘t be shy to ask for assistance! 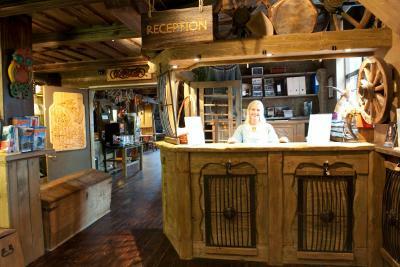 The Viking Village in Hafnafjöður consists of Hotel Viking´s 41 rooms, 14 Viking Cottages, and Fjörukráin Viking Resturaunt and bar. The rooms are well furnished including shower, WC and television. The décor of the rooms on the first floor is unique old-Viking style. The second floor have more of a West Nordic theme. 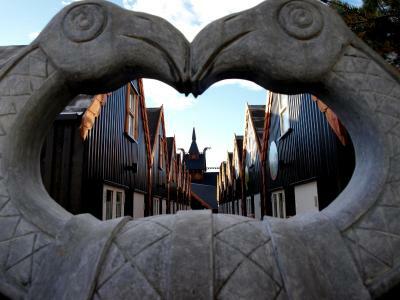 When you enter the Hotel, you are greeted with fine art and beautiful hand-crafted items from artisans residing in Iceland, Greenland and the Faroe Islands. Your stay of course includes wireless internet and free parking just outside the hotel. 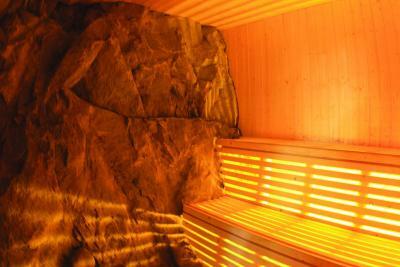 In our geothermal hot tub, and sauna you can relax and recuperate after a long day of adventure. The Viking Village has been a labor of love, developed step by step over the last 20 years and we sincerly hope you enjoy your stay with us! House Rules Hotel Viking takes special requests – add in the next step! Hotel Viking accepts these cards and reserves the right to temporarily hold an amount prior to arrival. Please let Hotel Viking know your expected arrival time in advance. You can use the Special Requests box when booking or contact the property. Rates on this website are quoted in EUR. Guests will be charged at the hotel in ISK and the exchange rate from EUR to ISK will be calculated based on the daily exchange rate. Please note that in case the bill is settled in local currency or by credit card, there might be a difference in the room price due to the currency exchange rate fluctuations. Nothing. It was all fine. The food was good but overpriced. We had more interesting food in other restaurants for cheaper prices. This place looks really cool on the outside, but it pretty much stops there. The WiFi was very unreliable, we ended up having to use our hot spot on our phone most of the time. The hot tub was not hot enough and it was dirty. The sauna never got warm enough either. The rooms were the smallest that we had in all of our stops in Iceland and the bathrooms looked like RV bathrooms. It was almost funny. The breakfast was barely eatable. When the person checking us out asked if everything was okay, I was reluctant to say anything, but she could tell that I was not completely satisfied and so she kept asking. When I told her a few things that we had issues with, she got very defensive and gave lots of excuses. 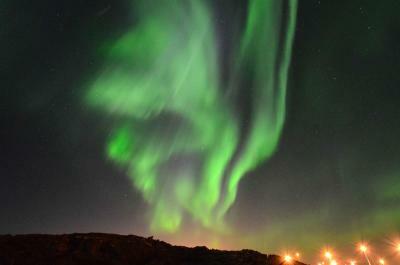 This was our worst hotel experience in all of Iceland. I would recommend going somewhere else. Lots of school (secondary school) groups staying overnight at the huts area meant that early morning noise to get the awake by teachers. Main hotel area probably best for quiet stay. Restaurant and nice very helpful staff and location. Not that much toiletries which are normally seen at hotels. The service by the staff. They have to learn to smile and how they answer a customer. The breakfast starts too late. It should be at 7 in the morning. We came 30 min. early and asked for a cup of morning coffee. The only thing we got was a negative answer that the receptionist was not allowed to open the door. Not a problem to accept this, but the way they said it was not the way they should answer a customer. Everyone we met on the staff at Hotel Viking was so kind and helpful. Even after hours, when we needed wine glasses, forks, and plates for the treats we'd bought at the nearby grocery store, a gentleman came to the door to assist us. The front desk attendants who checked us in and out were very sweet, and the free breakfast was delicious! We rented one of the cottages, and it was compact but still spacious enough for three adults to get some work done, read a book, eat snacks, snooze, and just hang out. When we walked in, we were so happy to see bunk beds as well, because bunk beds make everything better ("so much room for activities!"). The loft space with two twin beds was very cute, and I imagine kids would have a lot of fun with that. We didn't use the shower simply because we were going to be hiking and active in general, so I can't speak to that. Don't be afraid of the sulfur smell of the hot water, though. It's not a big deal to me, and my skin and hair have never been as soft as they were during my stay in Iceland. But in any case, the cold tap water was amazing and there is no need to buy bottled water in Iceland. I definitely enjoyed my stay at the Hotel Viking and would visit again. Walls were a bit thin, not a big problem but the neighbor's snoring was slightly audible at night. It had lots of free parking, great breakfast, a restaurant nearby and nice little hot tub. Staff was very efficient but not particularly friendly. It seem like it at times during breakfast we were in the way as they scurried around to refill breakfast food. The Breakfast was very good, eapecially the Salmon and the Bread. The town itself did not seem to have much charm or choices for restaurants.